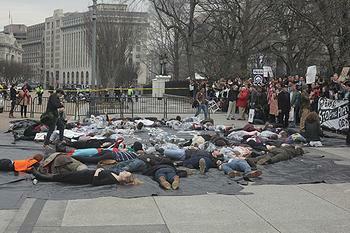 WASHINGTON, DC, March 2, 2014 (ENS) – Police arrested more than 370 young people who tied themselves to the White House fence on Sunday to protest the proposed Keystone XL tar sands oil pipeline. Called XL Dissent, the protest was organized by college and university students to urge President Barack Obama to reject the northern leg of TransCanada’s proposed Keystone XL pipeline, which needs presidential approval because it would cross an international border on its way from the Alberta tar sands to refineries in Texas. The protesters represent over 50 colleges and universities taking action as the fight over the Keystone XL tar sands pipeline is nearing a final decision. The State Department has completed its final supplemental environmental impact statement and Secretary of State John Kerry is expected to make a recommendation to President Obama shortly. Before reaching the White House the protesters rallied outside Secretary Kerry’s house on O Street with a banner reading, “Sec. Kerry: Don’t Tar Your Legacy” to push him to recommend that President Obama reject the pipeline. 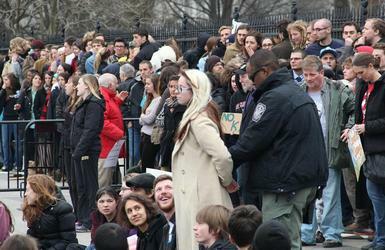 Protesters were orderly and cheered as U.S. Park Police warned them that blocking the sidewalk or strapping themselves to the White House fence would get them arrested. In total, 372 were arrested, police said. President Obama was at the White House on Sunday, but he was preoccupied with the incursion of Russia into Ukrainian territory. The President spoke separately Sunday afternoon with the leaders of Germany, Poland and the UK and issued a statement with the other G-7 leaders that activities leading to the scheduled G-8 Summit in Sochi, Russia in June would be suspended. If approved, the Keystone XL pipeline would carry 830,000 barrels of diluted bitumen a day from the Alberta tar sands to link up with existing pipelines in Nebraska that would move the bitumen to refineries on the Texas Gulf coast. TransCanada and its supporters argue that the extraction, transport, refining and burning of this heavy oil would not significantly increase greenhouse gas emissions. They contend that the United States and the world need this energy and and say it would create thousands of temporary jobs, while acknowledging it would create just a few dozen permanent jobs in the United States. “For them to rule that there’s no environmental impact is pure scientific garbage. We have to leave those dirtiest fuels in the planet in the ground. We can still do that,” said Hansen, who has himself been arrested for protesting the pipeline in front of the White House. As part of the protest, hundreds of students from across the country met Saturday to share strategies and tactics for the growing fossil fuel divestment movement that has spread to over 300 colleges and universities. The Fossil Free movement maintains that it is wrong to profit from wrecking the climate.